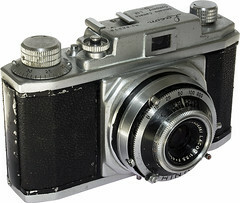 Shinano Kōki was a Japanese camera maker in the early 1950s. It made some versions of the Pigeon 35 and Pigeonflex, distributed by Endō, owner of the Pigeon brand. The Pigeon Six folder is also attributed to Shinano. ↑ Pigeon Six by Shinano: Kokusan kamera no rekishi, p.359. This page was last edited on 1 September 2017, at 05:22.